Consult the district geologist to obtain the preliminary geotechnical report sufficiently early in the project development process so slope ratios can be established during the preliminary plan phase. Also refer to the guidance found in Roadside Ditches since it also impacts the foreslope. 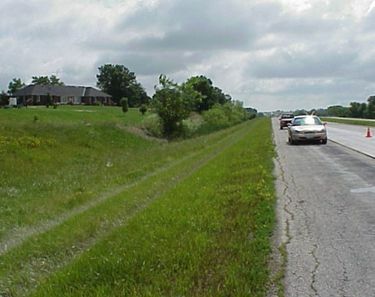 The roadway inslope typically varies from 1V:6H to 1V:2H depending upon the application of clear zone concepts and the soil report. The clear zone is the roadside border area immediately adjacent to the travelway. This border area is provided as a safe area for errant vehicles to regain control. It is desirable to provide clear zone on all roadway facilities with posted speed 45 mph or greater. The application of clear zone depends on many things including posted speed, roadway functional classification, accident history and cost comparison between clear zone and guardrail. Additional information concerning clear zone concepts can be found in Chapter 3 of the AASHTO Roadside Design Guide. The slope ratio given in the preliminary geotechnical report is a maximum and is not to be exceeded. As a rule of thumb, to satisfy clear zone requirements and to economize grading, fills 20 ft. high and lower can utilize a 1V:4H slope. Fills greater than 20 ft. in height will have a “barnroof” design (typically a combination of a 1V:6H with as steep a slope as permitted by the preliminary geotechnical report. This page was last modified on 12 August 2013, at 10:42.